To summarize my model, I've taken 94 expert rankings, plotted them in two-dimensional space of average range and absolute rank, and run a clustering algorithm on them. The result is beautiful charts capturing 94 expert opinions that help you decide who to start. Absolute rank is meaningful, but what you can't see from it is the true distance between two players. For example, Luck, Bradford, and Dalton are ranked QB15, QB16, and QB17 this week. However, by this method, you can see in the chart below that Luck is actually in a higher tier, and that QB16 through QB20 are actually close to the same. Between close players in the same tier, I recommend flipping a coin and going to bed, as experts who watch every game and analyze football for a living can't agree. Or just go with your gut. 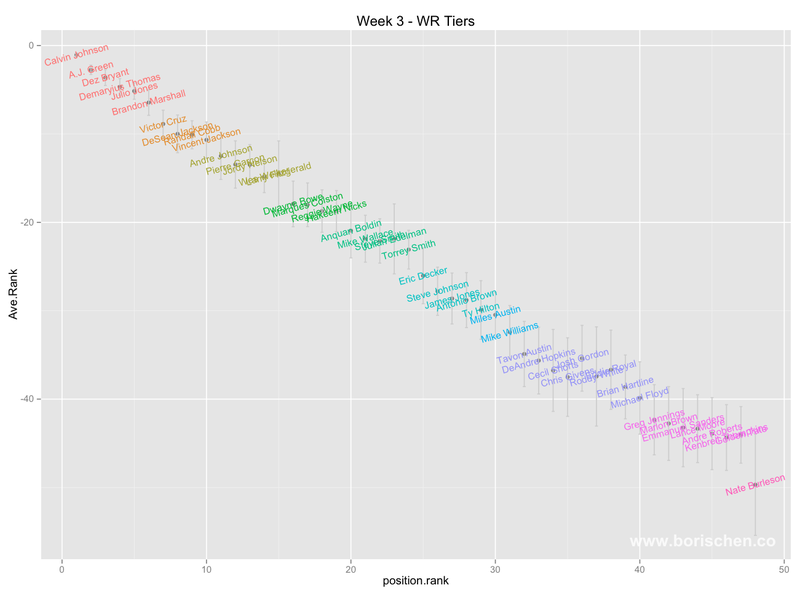 I hope to add a retrospective each week soon to see how my ranks and tiers hold up after the numbers are in. Until then, here are my charts and comments for week 3. 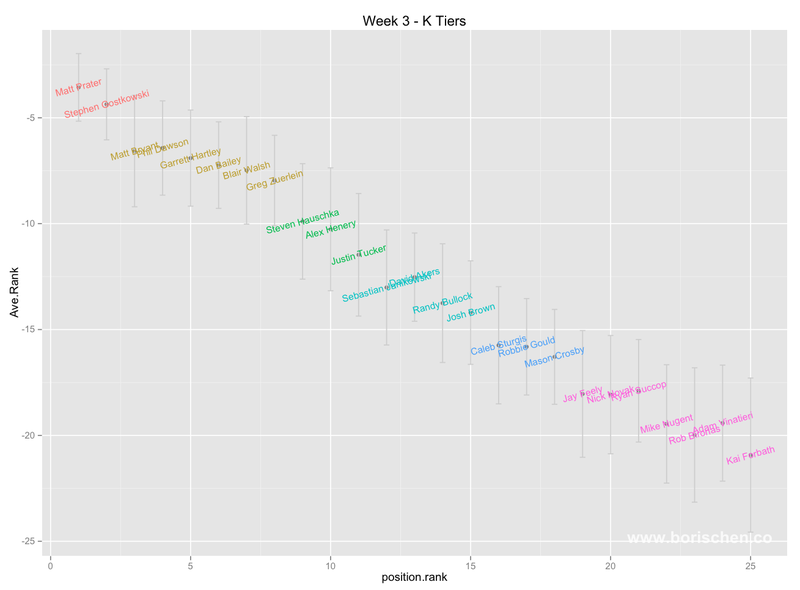 The PPR charts are on this page. As usual, I'll tweet any major updates as Sunday approaches if they come up. Peyton takes the QB1 spot this week with the Bronco's juicy matchup against Oakland. All tier 1 QB's this week could be the top scorer. 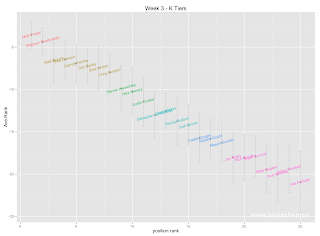 Vick continues to stay highly ranked in tier 2 with the likes of Matt Ryan. Out of the top 14 QB's, Luck has the worst matchup this week against the 49ers. 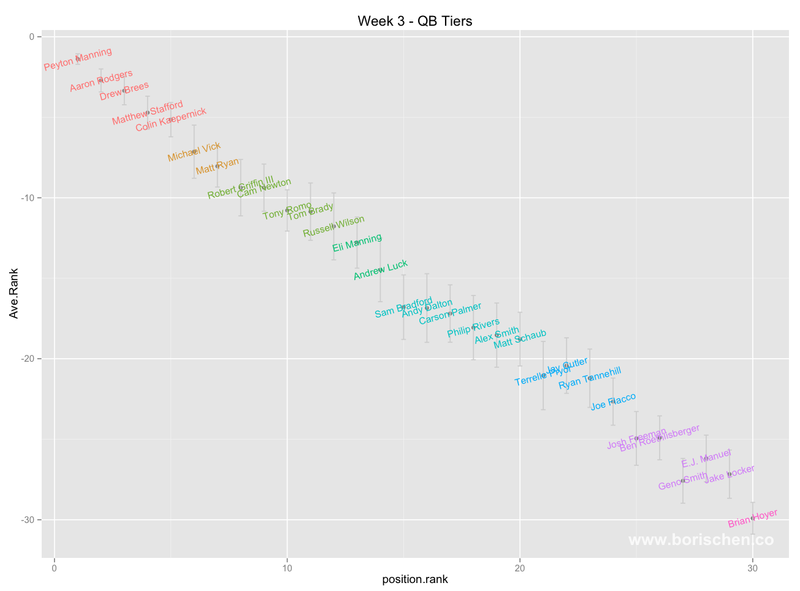 Brady is slipping, but QB's look like they should be mostly an easy choice again this week. In deeper leagues, it looks like QB15-QB20, that is, Bradford, Dalton, Palmer, Rivers, Smith, and Schuab are all interchangable this week. A Trent Richardson/Indianapolis Colts bomb dropped yesterday, and you can see that in the variance of his rankings, though experts appear to have him and Murray tied for the RB11/RB12 slot. Miller looks like he's borderline tier 4/5. Keep tabs on Reggie Bush and Ray Rice, as both are still up for question this week as to whether or not they will play. Tier 5 and 6 are extremely close this week. Bell, Mathews, Mendenhald, D. Richardson look about equal in tier 5. Similarly, Piece/Bernard and Bradshaw/Wilson/Starks. Looks like most experts are staying cautious of Starks this week. Bradshaw is an unadvised play with Richardson coming over. Keep close tabs on these players into the weekend. It's hard not to like any of the WR's in the top 3 tiers. Anyone through Fitzgerald, WR15, is capable of top production this week. The large drop off from Fitzgerald to Bowe that the algorithm identifies illustrates that. 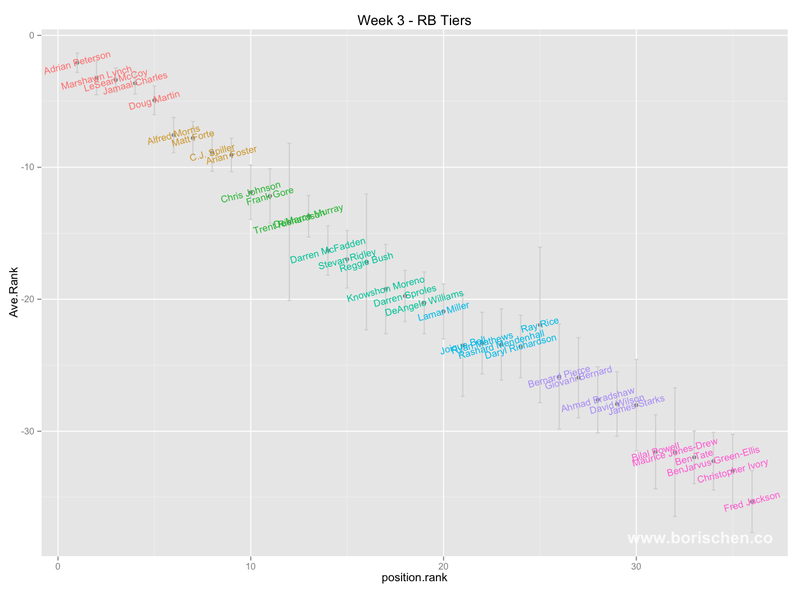 The WR rankings this week are pretty tame through WR48 with a few exceptions. Edelman's range is anywhere in tiers 4-5, but he averages out to around WR21-WR23 with Wallace and Steve Smith. His high variance is attributed to the questionable return of Gronkowski. Josh Gordon's first game back could not be more wild, with his QB Weeden out and now the Browns' run game non existent. The experts and my algorithm place him in tier 8 which I think is appropriate. Eddie Royal also drops into tier 8, which looks to be the boom-or-bust tier this week, from WR32 (Austin) to WR40 (Floyd). 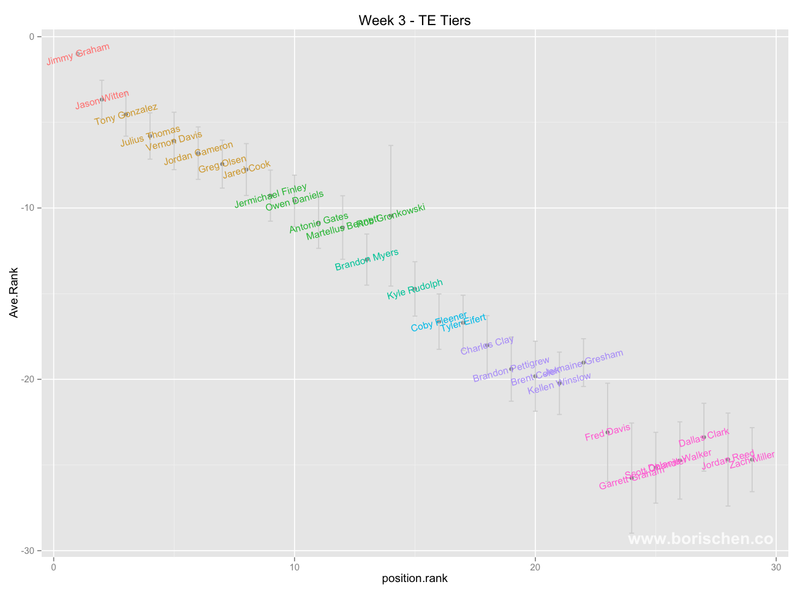 No real surprises this week at tight end through Bennett at TE12. All of the top 12 TE's have put up some solid numbers in the first two games. Gronkowski is the most interesting TE this week. The Patriots have been looking desperate. As of today, I wouldn't recommended starting him over anyone in tier 2, but follow him closely going into the weekend. Fleener, Eifert, and Clay are new on this week's radar, but it looks like experts need to see more before they start grabbing higher ranks. Reggie Bush and Ray Rice are the two anomalies this week. This is roughly where they would be if they are given a solid green light. 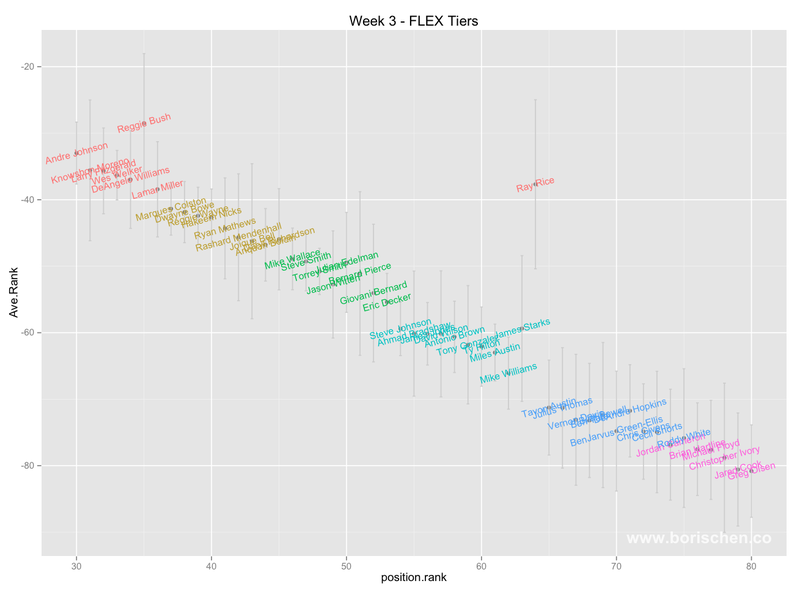 Flex continues to be extremely noisy within a tier, but the tiers remain solidly identifiable. Hopefully your flex decision comes between two players in separate tiers. If not, flip a coin and don't lose any more sleep. 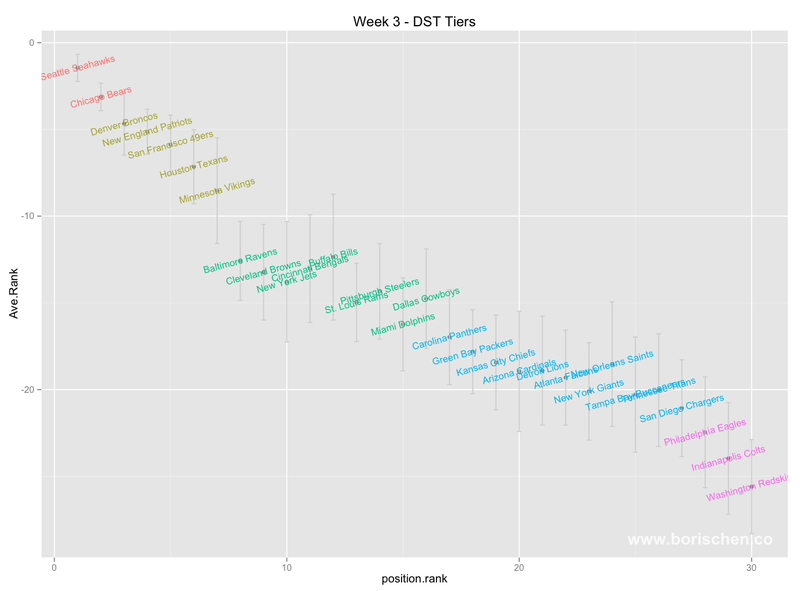 My kicker and DST advice remains the same: due to the high variance in both these positions, there is not need to drop and swap unless you are able to move up a tier. Moving up a tier is also certainly worth trying to trade for, if you can sweet talk your way into swapping up kickers or defenses as part of a trade deal. I wish everyone playing against the Seahawks defense this week good luck. You will need it. Don't forget to follow me on twitter for major updates.